HVAC’s Second Great EVE War series will return in a week or two. In the meantime, he’s taking a time out to discuss some more immediate current events. The stage was set. Pings had gone out to almost every major nullsec alliance; the battle to end all battles was near. 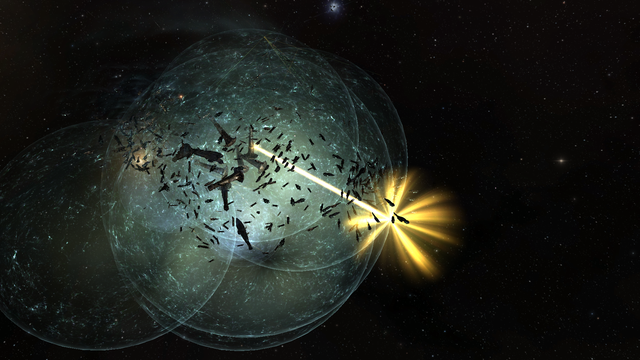 The largest fight in EVE history, both in pilots and by volume of the ships themselves, was about to happen. The press potential for the epic battle of HED-GP would have made Asakai, 6VDT, and the Black Legion Revenant kill all look like want ads in the back of the local Pennysaver. CCP had recently patched their servers to prevent node crashes that had interrupted several major fights in the previous months. If everything had gone right and the server gods were willing to play ball, it most certainly would have been the most destructive night in EVE history. Up until Saturday, my involvement in the southern conflict had been very minimal. I rarely do subcaps anymore (there are always a couple people who make comms unbearable), so whenever an opportunity to dust off one of my capitals arises I always take advantage of it. CFC fleets formed up on time, with one capital fleet filling up very quickly, and a second starting not long after. Our staging system in G-0Q86 became very unstable and TiDi started kicking in at absurd levels. Apparently CCP had put our staging system and HED-GP on the same node. Ten minutes later a message popped up in the client stating that G-0 was shutting down and being moved to a new node. Our capital forces were ordered to jump to the -A- system F4R2-Q and dock up. When the new node for G-0 came back online, a few more stragglers jumped to F4R and we waited a while for the subcaps and cynos to make their way to the field. Subcapitals were sent in to test the node to see if it would remain stable. After subcaps got in place, the Russian dreads jumped in. I’m not entirely sure if that was by design or if they jumped the gun early. I’ve heard both, but I’m inclined to believe the latter. Regardless, not long after the Russian dreads jumped our capitals were ordered to jump. Carriers first, then dreads about two minutes after that. I can’t really say what was actually happening on the field, or how the server was performing before the capital jump, but as soon as we jumped things on our side went to hell. The next 90 minutes would be spent in a capital jump animation, in some sort of weird server limbo where we were neither in F4R nor HED. 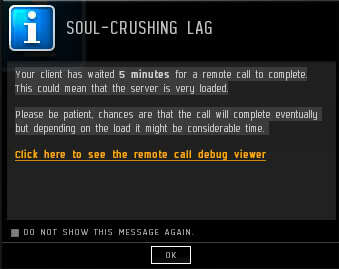 We started getting the Soul-Crushing Lag popup windows, and couldn’t interact with the client at all. All in-game chats ceased to work, and none of us knew if we were even connected to Tranquility anymore. After a while, subcapitals started reporting we were showing up on grid, while we were still stuck in jump transition with no ability to interact with the client whatsoever. Of the 350-400 CFC capitals who had jumped in initially, only a handful (less than ten) were able to do anything. We were stuck in this state where the game server was recognizing us as on the field, but not allowing us to issue commands. The grid wouldn’t load, so our weapons were useless. None of our modules would activate, so we couldn’t even attempt to tank the incoming damage. This also meant that we couldn’t use siege as a defensive tactic. Eventually after several hours of no-response from the server, I had contacted Forlorn in the CZ Skype channel and asked him to relay a message to a couple of their titan pilots to doomsday me if they got the chance. CSM8 representative Sala Cameron answered the call, and thankfully euthanized me. Despite still being in jump animation and modules not activating, I did get to see the doomsday damage notification and my Shield/Armor/Structure bars go to zero. Even though I had been stuck in jump for five hours, my “quick” death allowed me to go out and make plans that night. So the day wasn’t at a total loss! I’m glad the server didn’t crash, but in the end I’m a little annoyed at the realization that it isn’t possible to have that gigantic nullsec slugfest that I’ve always dreamed of. Supercapitals only die when one side gets jumped; the opportunities for brawls like that don’t happen often enough where both sides get time to prepare.